This was my first time baking a butter cake. The cake turned out looking a little heavier than I’ve wanted it to be, but I was delighted that my friends enjoyed the cake nevertheless. Phew! Preheat oven at 180 degrees. Grease loaf pan with oil. Whisk butter, sugar, lemon essence and salt in a mixing bowl on medium speed till light and fluffy. Add eggs 1 at a time. Whisk on medium speed for about 8-10min. Fold flour, almond and baking powder into mixture. Fold chopped apricots into mixture. Pour mixture into loaf pan. Bake for 1 – 1.5 hrs. Turn out cake bottom side up onto a cooling rack. 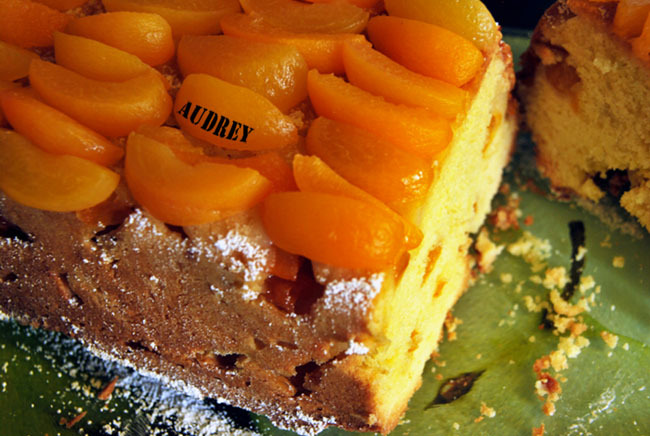 Place sliced apricots onto top of cake. Leave to cool for 1 hr. Leave to chill in fridge to let the apricots on top of cake set. Sprinkle a little icing sugar on top of cake before serving. Replace lemon essence with rum essence or 1 tbsp of real rum for a stronger flavoured butter cake. Replace apricots with other types of frozen fruits (e.g. raspberry, blackberry, blueberry or strawberry). I used double-acting baking powder for this recipe, which was probably a mistake since the excessive raising of the loaf led to undesirable cracks on the cake while baking. So being kiasu is not the key to baking a good butter cake after all. I also used canned apricot instead of frozen ones as I couldn’t find the latter at the NTUC. This could have led to the cake looking a little more moist than it should be, due to the syrup from the can. This entry was posted in Cake, English and tagged Baked, Fruits. Bookmark the permalink.